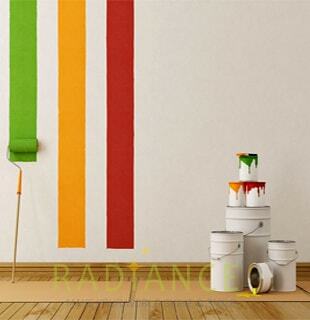 Radiance’s paint treatment focuses on re-coating the top layer of paint on your plain walls to instantly add gleam and shine to your premises. This treatment is performed in record time by experts and significantly enhances the visual appeal of your facility. In this 3-stage process, walls of the premises are audited in terms of size and colour. Then we use a computer-generated colour code to ensure an exact shade match. Finally, paint is applied with great care by our trained crew to ensure the highest standards of finish. During application of paint, extra attention is focused on reducing spillages and waste. Transparent plastic sheets are placed below the wall being painted, to avoid paint from spilling and staining the floor and carpet. Safety is given paramount concern and all painters are turned out in professional uniform with safety gear such as safety glasses, face masks and shoe covers.